I was dining with David, Emily, Stefano and Jason (filling in for Edith). We started by having a quick chat with Ewan McDonald, the owner, before getting to see the kitchen and meet Head Chef Robert Sabongi. We were seated and after perusing the new menu (which had only swung into operation that day) we ordered a selection of dishes. To begin with, we received a pre-starter of a scallop on celeriac purée- the scallop was cooked nicely, the only slight niggle was that the purée was a little too rich for my taste. I started with the seared tuna, which was nicely cooked and served with a beautiful fragrant salad. There were bold, punchy flavours of ginger, sesame, pomegranate. I really enjoyed this, it was light and delicate course to start the meal and yet packed a punch in terms of flavour. For the main course, myself and Jason opted for the duck breast. The duck was nicely cooked, and served with a purée of carrot flavoured with star anise. It was accompanied by some cabbage fried with bacon. It was a very good dish indeed. Simple food, done well. For dessert they brought us out a selection of the desserts that are offered on their new menu. The whipped mascarpone was by far the highlight for me. Light, served with raspberries. I would bath in the stuff. Apologies for that image. If I had to choose what to eat in that bath? The apple pie. It was like something your granny used to make. All of this was accompanied by some very nice wines, paired with the dishes by Karl, who was looking after us very well that evening. There is some nice cooking going on in The Library. The new menu is packed with tasty and wholesome winter dishes, and everything, down to the burger buns (which we actually got to taste- after dessert) is done in-house. It’s most certainly worth a visit- poke your head in the door, walk across the bar and take a seat up in the restaurant amongst all the books! But before all that happens, I decided to celebrate with a few friends over the weekend in The Pig’s Ear on Nassau Street. I could only get a 9.30 booking but as we all had commitments earlier in the day it suited us to eat later. 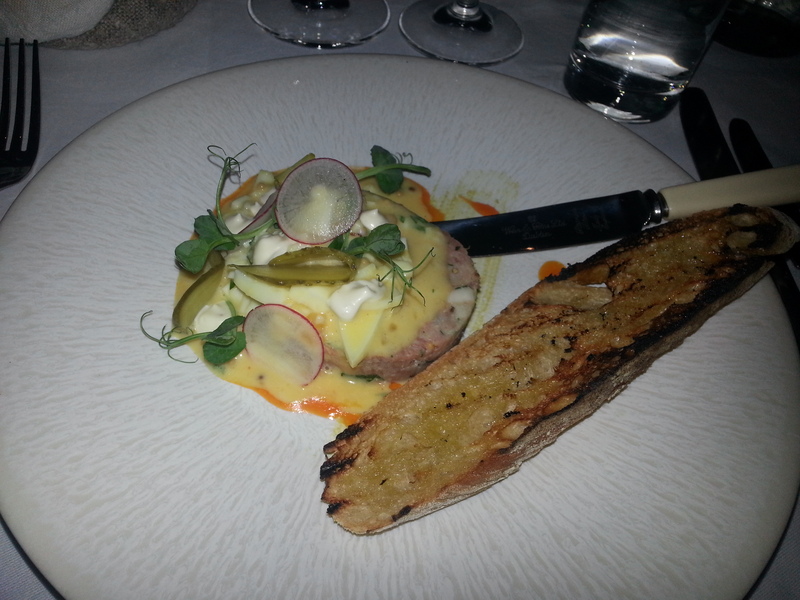 For starter I had a ham hock terrine which I very much enjoyed. It was served with a chopped hen’s egg and a nice piece of toast. It was a very pleasant dish, perhaps the terrine could have had a stronger flavour but it was a very clean plate returning to the kitchen. Another starter highlight was the cured salmon. It was served sliced slightly thicker than I have seen elsewhere and was delicious. Despite the cure you could still taste the salmon. It’s owner, a confirmed foodie, was very satisfied. Another hit was the Jerusalem Artichoke soup, which I also tried and while it isn’t something I would ordinarily order, it was very pleasant. For mains I had the halibut, served with cauliflower and some potato in some sort of delicious citrusy dressing. There were also glazed sultanas on the plate and nuts. I really loved this dish, the fish was cooked nicely, there were wonderful contrasts on the plate, textures, sweet and sour notes. A real winner. The confirmed foodie had the venison and was very impressed with the celeriac it was served with. Others had the chicken, which looked very pretty. Reports suggest it was a little on the bland side for their tastes. Desert was death by chocolate. I went for the warm chocolate tart. Myself and the confirmed foodie differed on the need for popping candy on it (I liked it-blame the fast disappearing child in me.) The tart had a rich, smooth filling on a good crust. Delicious. Others opted for ice cream which was well received. Unfortunately after a very pleasant meal, the evening took a bit of a turn. Only an hour and a half after ordering, the staff started a clear up in earnest. As we had our coffees, tables were moved around us, any wine glasses drained were whipped from the table seconds after putting them down, no fear of being asked would you like another drop. An unfinished water bottle was also removed from the table. While I appreciate people have homes to go to, if you take a 9.30 booking on a Saturday night- you should give them the time to enjoy their meal without feeling like an imposition. When kitchen staff came out and started chatting and joking with the waiters behind us, as coat stands and tables whirled by (literally), we called it a day and asked for the bill. The total (for 5) with wine came to €276, was the food worth it? Absolutely. Would I go back- not anytime soon. I had the pleasure during the week of finally getting to visit the ‘new’ Avoca in Monkstown. Having heard much about the beautiful shop, the impressive James Whelan butchery counter and the wonderful wafting smells of rotisserie chicken courtesy of Poulet Bonne Femme, not to mention the walk-in cheeseroom- I was excited to finally pay the place a visit. We dined midweek and in what was sign of things to come we walked into a very busy restaurant. Upon being seated a jug of iced, minted and cucumbered water was produced without asking. Glasses were filled and another full jug placed on the table. Good start. The decor is distressed mirrors and tables etc. and is a very pleasant place to spend a few hours. As we did. I started with the crispy hens’ egg, served with asparagus and hazelnut mayonnaise. The only thing I can fault with this dish was that my egg had just gone past runny. However the asparagus provided some nice crunch and contrast. The hazelnut mayonnaise was delicious and really tasted of the nut. I cannot abide when chefs put something on a menu that promises to taste of something and doesn’t. However thankfully this was not the case here. The other starter at the table was the Gold River Farm beetroot. Approving noises were made about it. In fact it was described by the very seasoned diner as one of the best starters they had eaten. From my vantage point it certainly looked stunning. I had the Casteltownbere crab tagliatelle for mains. This was a delicious plate of pasta. There were wonderful contrasts and it was full of crab. I also got to try the fillet steak, which was very flavoursome and the others ordered Hake- which again was accompanied by pleasant mutterings. Having hit a food-wall midway through the tagliatelle, I was unsure about ordering desert. 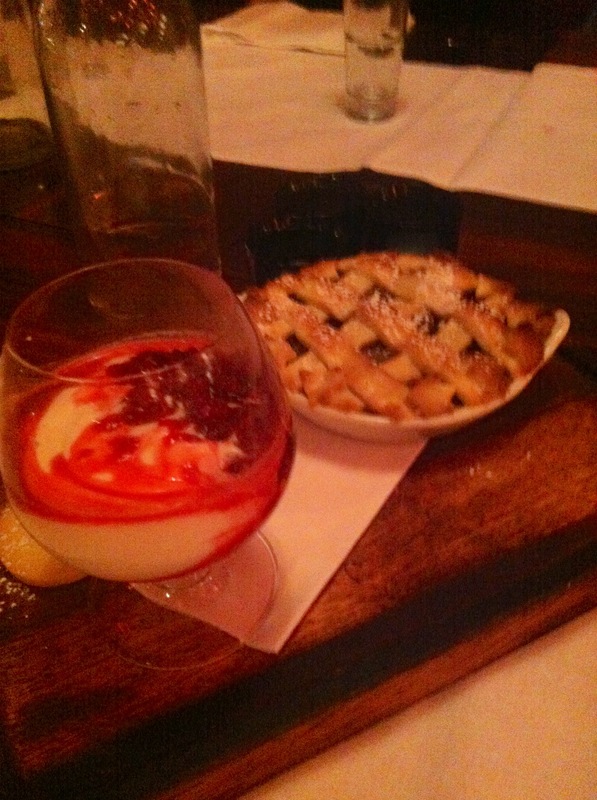 However I persevered and ordered the raspberry and crème fraîche panna cotta. This was very fresh and zingy and was the perfect end to the meal. A special mention has to go to the pistachio biscuits that accompanied this. They were slightly spiced/cinnamony and were delightfully chewy. The chocolate and hazelnut mousse was certainly the prettiest plate at the table and delivered on taste. The chocaholic in the family shockingly opted for the apple tart tatin- which she enjoyed. Dinner was rounded off by a generous pot of loose-leaf mint tea. Special mention has to go to the service. It was faultless, yet you barely noticed them. The water jugs were replenished immediately, there was a napkin to catch the wine drops when pouring- also they were attentive to make sure this never ran dry either. What was very impressive was that every plate that left the pass was wiped for fingerprints. I have been in places in the last year that would be considered amongst the best restaurants in the country that couldn’t manage to de-print a plate. I would strongly urge you to include more Salt in your diet.